Check out our Autoglym HD Wax Review. Is it worth the money? Great durability – outlasts waxes costing £££s more! Click here to see what others are saying.. The Autoglym HD Wax is a great mid-entry level wax. It isn’t the cheapest car wax but you get more than what you pay for. Like any wax you must make sure that the paintwork is washed, free of tar and preferably de-contaminated using a clay bar to ensure that the wax is protecting the paint and not a dirty surface. If the paint is dirty or hasn’t been polished for a while, I personally recommend using their Super Resin Polish to thoroughly clean the surface for better results (it also reduces the appearances of swirl marks and scratches for even more gloss). Once clean it is a relatively straight forward process, simply smeared on with the included applicator to form an even coating over the entire car. If you apply to all paintwork you then have a chance to apply any dressings required and any mess can be cleaned up when you buff off the wax ;). It needs to be left to cure for around 10 minutes then the remaining film buffed off with a quality microfibre towel. Very quick clean up and very good gloss. The wax itself will leave a high gloss finish that will make most paintwork look like new and stay like this for several weeks. It is actually a recipe that Autosmart tried to copy but after a visit to their factory, the simple but essential machine that blends and compresses the wax makes it a very different product..into one that actually works! Dirt & water will slide off easily and washing becomes a breeze. The use of quality car washing equipment will help to keep the surface in perfect condition. They obviously recommend their own shampoo conditioner (which is essentially shampoo with rinse aid to help water sheet off) and it is good but I much prefer their plain, ph neutral, cherry scented shampoo that you can’t buy in the shops but if you’re quick you can buy from here. If you haven’t used a premium car wax before then it is well worth trying as you will love the results for the little effort required. It will keep up with wax worth 5x as much in terms of gloss and protection and is easier to use. Who says you can’t have your cake and eat it?! 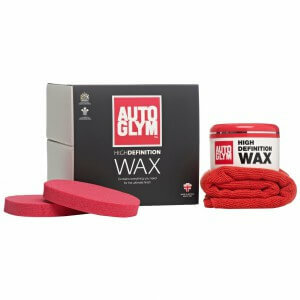 Click Here to buy Autoglym HD Wax for £10 less than the shops!